DJI X7 camera with 6K! October 11, 2017 – DJI, the world’s leader in civilian drones and aerial imaging technology, today introduced the Zenmuse X7, the world’s first Super 35 digital film camera optimized for professional aerial cinematography. 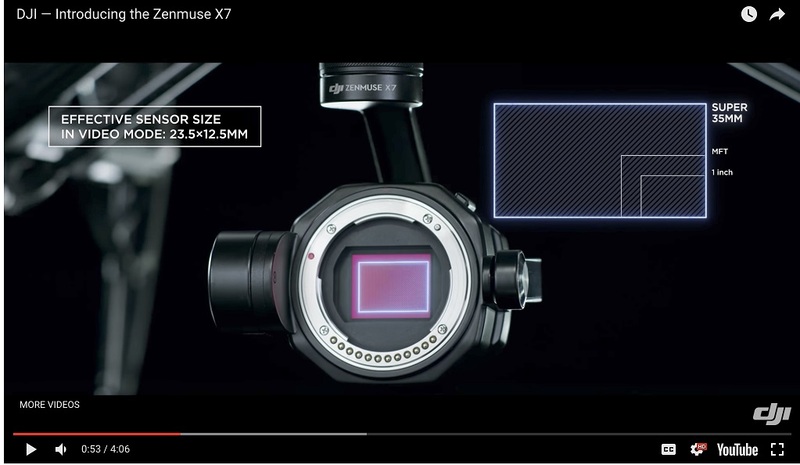 Designed to work seamlessly with the DJI Inspire 2 drone, the Zenmuse X7 delivers superior image quality, interchangeable lenses, and a new DJI Cinema Color System for post-production to give film and video professionals more creative freedom. The Zenmuse X7 is equipped with a Super 35 video sensor featuring 14 stops of dynamic range for more detail in low-light conditions. Its low-noise image capture enhances grading flexibility by preserving details in both highlight and dark areas while enabling a shallow cinematic depth of field. To meet the rigorous requirements of filmmakers and television production professionals, the Zenmuse X7 captures the highest image resolutions ever for an integrated drone camera. It is capable of shooting 6K CinemaDNG RAW or 5.2K Apple ProRes at up to 30 FPS, as well as 3.9K CinemaDNG RAW or 2.7K ProRes at up to 59.94 FPS to integrate seamlessly into industry-standard post-production workflows. 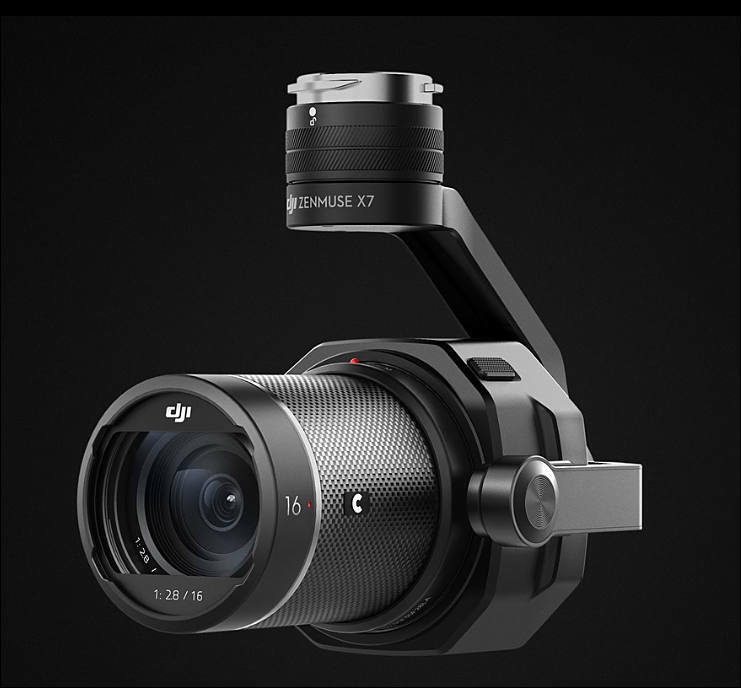 The Zenmuse X7 uses a dedicated aerial mount system, the DJI DL-Mount, featuring an ultra-short flange focal distance to carry prime lenses optimally. Available with focal lengths of 16 mm, 24 mm, 35 mm, and 50 mm, each lens has a maximum aperture of F/2.8 and is crafted out of carbon fiber, making them durable and lightweight for high-performance aerial cinematography with the DJI Inspire 2 drone. To allow for advanced setting adjustment and fine-tuning, the 16mm lens is equipped with a built-in ND 4 filter, and the 24 mm, 35 mm, and 50 mm lenses feature a mechanical shutter. DJI has also introduced a new DJI Cinema Color System (DCCS) making the Zenmuse X7 an asset on every film set for movies, TV series, commercials, documentaries, and more. DCCS features a new D-Log Curve and D-Gamut RGB color space to give more flexibility and color options during the post-production process. The D-Log further extends the dynamic range, while the D-Gamut RGB color space preserves more color information to support the most demanding filmmaking scenarios, providing accurate color for quick and easy post-processing. The new EI Mode mimics the way a film camera works to help cinematographers capture as much information as possible in every scene while balancing the dynamic range and noise with different log curves for more flexibility during the post-production process. The Zenmuse X7 gimbal system weighs just 631 grams with the 16 mm lens. The DJI Inspire 2 has a flight time of up to 23 minutes with the Zenmuse X7. For more info about the Zenmuse X7, visit www.dji.com/zenmuse-x7. The Zenmuse X7 camera is priced at $2,699 USD. The 16 mm, 24 mm and 35 mm lenses will be available for $1,299 each, and the 50 mm for $1,199. Customers can purchase the Zenmuse X7 prime lens combo including all 4 lenses for $4,299. The Zenmuse X7 will start shipping in early November 2017 from store.dji.com, in DJI Flagship Stores and through DJI Authorized Dealers worldwide. DJI Care Refresh will be available for the Zenmuse X7 camera gimbal system as well as for the Inspire 2 drone. For more info, visit http://www.dji.com/service/djicare-refresh. There are no adapters announced for the DL mount (why why on earth do we need a new mount standard???? Sigh), but give it a few months and I'm sure third parties will release them. Mount looks like Pentax one, but different. The DL mount is meant to be waaaay more shallow than the Pentax K Mount. 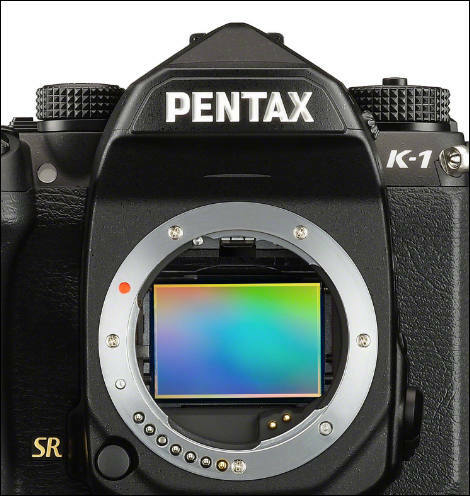 But it is interesting that they used first ever approach having lens contacts (I mean Pentax KA lenses that encoded their open F stop). It’s interesting they choose to go with new mount ,but I’m worried later if adding adapters and heavier lens will not be a good combo ,thus we are forced to use the expensive dL mount lighter lense ...I know the battery will be effected with increased lens weight ,but how much can the gimbal cary as far as added lens weight (if we are able to adapt manual lenses ),any info released on that side ? I see no adjustment available for gimbal. So most probably weight distribution is exactly same for all lenses. 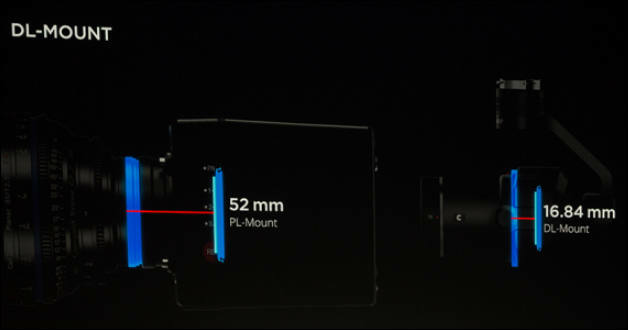 The reason for the new lenses are most likely for weight distribution. Carbon fiber lens body, internalized focus motor, and fairly similar length will help keep the X7 + lenses balanced and not burn the motors. Putting "cheaper" pancake glass on this cam sort of misses the point. My understanding of this new offering from them is an attempt to go after bigger budget commercial and TV work. Alexa is quite common in those circles and they seem to pushing the color science and skin tone thing pretty hard (something Alexa is well known for). And while I can't speak for everyone else, I usually try and shoot between F4 and 6.3 whenever possible. The sweet spot for most glass we use on the I2 is right around F5.6. And this new sensor seems to offer additional creative options for a shallower depth of field. This is new territory for DJI and currently only available when we rig up a heavy lifter to carry larger camera's with full FIZ control. So will be interesting to see some shots by actual crews who adopt this system in field in the near future. The image sensor size is very close to that of the Arri Alexa, and supposedly has 14 stops of dynamic range (claimed), just like the Alexa. As far as selling a bigger budget client on a platform, these are MASSIVELY beneficial specs. If you're looking for a cheaper option that you can put cheaper glass on, it already exists. Have a look at the X5s. Lenses for it are dirt cheap comparatively. Again - aerial only. Currently no handheld option for either one. "nothing wrong with shooting f8 aerial footage ,infact that’s what needs to be done with larger sensor"
Agreed that there's nothing wrong with shooting aerials at F8 (if that's what is needed for a given scene). However, there are times when a shallower depth of field is required. Having aerial footage that's always focused to infinity is boring and often screams GoPro. Useful when you need it. But hopefully not the default. Hopefully their existing focus wheel plays nice with the new lenses. I never bought into it as of yet since there were reports of issues with it. Anyway - I feel you on the lens costs (being that they do seem to be proprietary). But if you do this for a living, then it's easier to swallow. Hell - my I2 with several lenses and the RAW / prores license paid for itself in 3 months. So if the glass is as good as they're claiming, then I'll most likely be upgrading. The SSD's are where I tend to feel violated. So overpriced and no 3rd party options. Definitely a move taken straight from the apple playbook.